This area of Costa Rica remains one of the most unspoiled and biodiverse places, not just in this friendly country, but in the world. Home to Corcovado National Park and more, this ecosystem supports wildlife that includes four species of monkeys, flocks of scarlet macaws, toucans, sloths, iguanas, anteaters and countless birds. The nearby gulf is a seasonal route for whales, but dolphins and whale sharks are regularly seen here. Butterfly species and exotic insects are of interest to the curious. The gorgeous blue morpho graces the shaded areas often. The flora is as varied as the fauna with smells and taste never before experienced. A small 'ranchito' is available for comfy shaded relaxation and picnic fun on the beach. Be sure to check out the many options for adventure, exploration and peaceful serenity in this unique, remote jungle paradise. 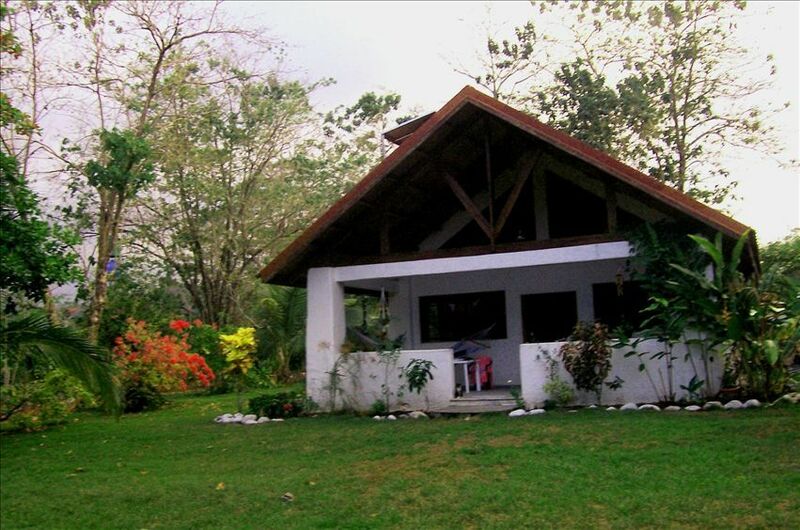 Casa Gavilan is the perfect place to get away for adventurers hoping to experience Costa Rica on the OSA Peninsula. There is no electric grid here. Instead a well maintained PV solar installation which served all of our electrical needs. Keep in mind there is no tv and we could not get the internet to work during our stay. You will definitely want to plan your meals while shopping for groceries in Puerto Jimenez as traveling 13km (8miles) down a dusty, bumpy road is not just a quick trip back into town. However, in our opinion the remote location and the absence of conveniences is worth the sacrifice! Also be prepared for no cell service or internet as the city limits of Puerto Jimenez was our only opportunity for contacting the outside world while staying in this region. The wildlife at dawn combined with the sunrise across the water each morning is something that can’t be duplicated anywhere in the world. All in all we will definitely consider Casa Gavilan if/when we return to the OSA region of Costa Rica. Thank you Bernie aka Bill for sharing your Casa . It was a truly amazing experience! Sincerely, Randy, Joyce,Mike, and Liz. so glad to hear you enjoyed the casa and area. too bad you did not ask for help with phone booster and router for internet. We do have service! Nice house in a good area. The house is off the grid in a relaxed area. Great neighbours. Large house, a bedroom up and down. Loved the outside shower and wonderful flowers throughout the property. Road to the property from Puerto Jiminez is very bumpy so 14kms took us 40 mins. In other words don't expect luxury in this wonderful but remote area. It's about the nature! Great birds in back yard, macaws and red-lored parrots, and orange-chinned parakeets, tanagers, fire-billed aracari, etc, but not mammals. Great nature a nearby walk or drive. We saw 4 species of monkeys, ant eaters, peccary, agouti, coati mondi, basiliks, geckos, etc. Beach is close, not sandy but when tide was low I layed in a tidal pool that was like a hot tub. Outdoor shower was really nice. Kitchen was well stocked. Gas stove, blender, basic fridge (again solar powered). There are lodges nearby (way more expensive) that have nice cool fruit drinks to cool you down on hot amazing nature walks. Overall, a very nice place to stay. Have you ever booked a vacation rental and upon arrival are totally disappointed because the amenities that were promised didn’t exist? That’s what happened to us when we booked and prepaid for Casa Galivan, the place had been misrepresented by the owners on the posting. After voicing our disappointment of all the amenities that didn’t exist I notice the website has been updated. But note, there is still is no hammock on the beach. My husband and I spent the better part of a day repairing screens, they should be good for awhile. (After an infestation of flying beetles I wasn’t prepared to continue on without doing something about it. There is no screen way up top in the front but there doesn’t seem to be lots of bugs coming in up there). The toilet should also be ok for awhile after tree roots were removed from the pipes and tank. That was day 5 and 6 of our visit. Must say I was disappointed when the owner didn’t respond to my request for cleaning supplies to deal with disinfecting after the sewage backup! And then there were the hammocks on the deck. My husband landed on the ground the one day due to the rotten rope. It’s ok now that he has replaced some of the ropes, but who knows for how long. You fix as you go with whatever you can scrounge or buy in town. The one set of sheets that you get for the bed are thread bear and ours had little cigarette burn holes. Yeah, they work, but... And a majority of the towels were stained, just saying. You don’t expect the same quality as a five star hotel, especially down in the Osa, but I’m just letting you know what to expect. Better to go in with your eyes open. As for “wildlife galore”, birds yes, wildlife (?) on premises, not in our 18 nights! We, the owners of Casa Gavilan, would like to respond to this negative review. First of all, these clients arrived in Costa Rica after a very tiring trip and were not in a positive mind frame, which started them complaining. It is true that 2 items that were listed as Amenities were not available or obvious as they came to the rental. One of these was a DVD player and libary which was given to them from a property manager within 24 hours. [These days DVD are almost obsolete as there are more modern methods of viewing movies, series and TV.] The second Amenity was the mention of hammock on the beach. There were 2 hammocks on the patio which were available to take to the beach. We no longer leave hammocks on the beach as they are usually taken by a thief. There is also a place for these hammocks a short walk from the property in the shade under a palapa, which would have been shown to the guests or described if they had asked. It is a complete exaggeration regarding the condition of the screens on the house. However, most visitors to this area in January would attest that there are no biting bugs in the dry season. Beatles sometimes have a hatch and will come to any light, and they do find a way in no matter what exists to prevent entry. As for the non existent cleaning supplies, they were there in the garage in a fairly obvious location. Again the client NEVER asked by phone, email, or site manager. There were multiple sets of clean and better quality sheets for the bed in a linen box that is clearly marked; another item for which was NEVER asked. The owners of Casa Gavilan do care about our clients and we are available to respond to any and all contingencies. There is wildlife galore beyond the birds, like monkeys, anteaters, pizotes, mapaches and sea life. We are not sure why these clients were so unhappy. my husband and i stayed at Casa Gavilan [means hawk] and we saw couple on the osa peninsula, and we enjoyed waking up with the vocal, beautiful, scarlet macaws daily. then later we saw; , monkeys, countless birds, anteater, pisote...the house was very comfie with more than the basics. we plan to return soon. We are so glad you saw a fair amount of wildlife. As typical with animals they don't have same schedule we want. We stayed here last March and liked it so much we came back in July! The house is very comfortable with a short walk to the beach and surf. We saw an incredible amount of bird life along with monkeys and other jungle animals. The location provides both a beach sunrise and a mountain sunset view. We will stay here again! We soo enjoyed Matt and Tela visits. We knew they must have really liked Casa Gavilan, when they asked to come back. They even planted some grass for us, thanks again. my husband and i just visited this area of the osa peninsula,and we enjoyed waking up with the vocal, beautiful, scarlet macaws daily. that was just the start of the wildlife we saw; turtles, monkeys, countless birds, anteater, sloth...the house was very comfie with more than the basics. we plan to return soon. thanks for the good review. we will certainly look forward to your next stay at Casa Gavilan on Playa Sombreyo.